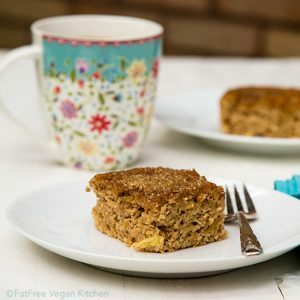 Not only is this vegan pineapple coffee cake completely free of added fats, it also uses no white flour at all and contains very little sugar. That was my daughter’s way of admitting that she had been feeding the cat pieces of cake under the table. I laughed so hard I nearly choked on my own cake. E. has picked up enough from me to know that I think animal testing is a bad thing, so she assured me that the cat liked the cake and therefore wasn’t hurt by the testing. We were celebrating my husband’s birthday with pineapple coffee cake and Equal Exchange French Vanilla coffee (E. had chocolate soymilk). I consider myself a lucky woman to have a husband who not only is kind, loving, and smart as hell but also has a relatively small sweet tooth and doesn’t mind having a birthday cake that’s just as good for him as it is good. 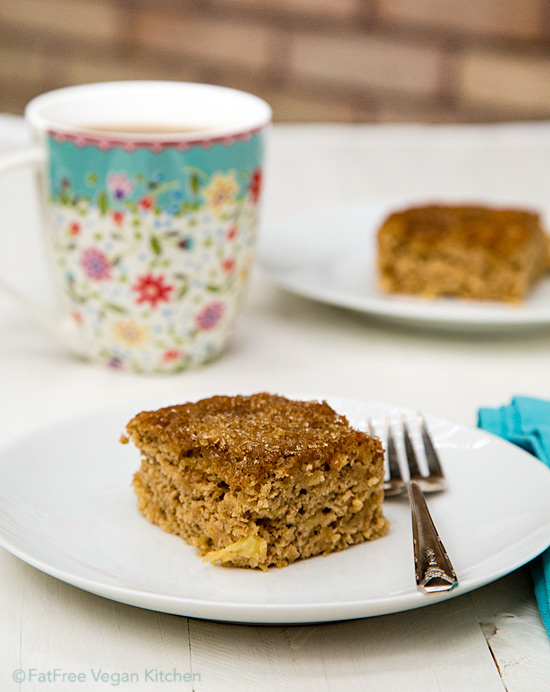 Not only is this cake completely free of added fats, it also uses only whole wheat and oat flour–no white flour at all–and contains very little sugar. It’s a dense cake without being heavy, and the sprinkling of sugar on top gives it a sweet crunch. I strongly recommend using a coarse sugar such as demerara or raw sugar for the topping–it keeps its shape during baking and provides that crunch. Put the oats into a blender and grind until they are fine. Stir a couple of times to make sure that they’re uniformly ground. Mix the oat flour with the other dry ingredients. Add the wet ingredients and stir until moistened and completely combined, but don’t overmix. Pour into the prepared pan (batter will be thick). Mix together the sugar and cinnamon topping, and sprinkle it over the top. Bake for 30-40 minutes, until a toothpick inserted in the middle comes out clean. Allow to cool for at least 15 minutes. Cut into 9 pieces, eat, and celebrate! See all of my fat-free vegan cakes here. 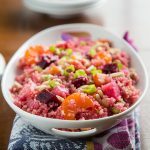 I made this recipe last night and it was delicious!! I only wish I could find a way to work more pineapple in…. 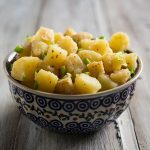 I love the this fat free recipe and I am seriously going to give this a try. I especially like the fact that no eggs are required which helps the cholesterol. Very happy to see this recipe. My husband also appreciates healthy treats. Last year his birthday cake was really just a great big wholesome muffin, which he adored. Tried this 2 times last week. 1st time I did the recipe as written and it was delicious! 2nd time I used white whole wheat flour and made 24 mini-muffins…. I think I like them as muffins better. The only thing tho, is that after the first day, the exterior of the muffin gets kinda sticky b/c of the fat free-ness… so the cake works better if you don't want sticky fingers all week. I'm thinking about making the mini-muffins for my friend's bridal shower brunch tho, cuz I'll make them that morning when they'll still be fresh, warm, and unsticky! Thanks for this post! I got some of the post-punk kitchen cupcake/cookie cookbooks for christmas and gained a few pounds trying them out! So I'm so thankful I have your recipes to count on when I need fat free deliciousness. What a wonderful sounding recipe! I can’t wait to try it! I think you could probably take chunks of pineapple and “crush” them in a food processor. You’ll also need to add some pineapple (or other fruit) juice to them to get them to the same juiciness as canned. It may take some experimentation to get the liquid level just right, but I think it would taste great if you do. 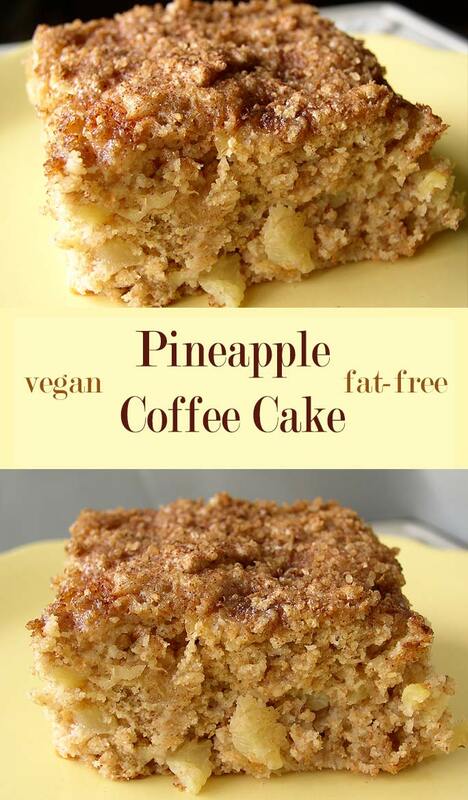 I was wondering what to do with the whole fresh pineapple I froze last week … so decided to give this cake a go. I defrosted sufficient pineapple to measure 1 cup defrosted but still a little chunky when blended. There was certainly enough juice with small pineapple pieces remaining. Probably needed a little more cooking time .. a bit too moist in the middle … but tasty with a light pineapple flavour. Will give it another go and see if I can improve. Thanks. What a lovely sounding recipe! You inspired me to go to the store and get pinapple right away. Just one question, what would you suggest as a egg replacer if Ener-G wasn’t available? I have silken tofu and ground flaxseeds, do you think either of those would work ok? Did you use the equivalent of one egg or more? I would substitute 1 1/4 teaspoons of cornstarch, potato starch, or tapioca plus 1/4 teaspoon of baking powder. If you don’t have those, then I would probably go with 1 teaspoon of ground flaxseeds, though I can’t promise that the results will be as good. i love pineapple so i was excited to try out this recipe. it came out a bit dense. I made this yesterday and even though I used flax seeds instead Ener-G egg replacer AND I forgot baking soda it was still delicious! Such a nice flavour combination, I haven’t used pinapple in anything for ages, but now I remembered how good it is again. Thank you Susan! This was great!!!!!! My whole family loved it, including my toddler! Definitely will make it again. This looks like great recipe! but I don’t have any way to grind the oats! What can I do instead?? Becca, you can substitute oat flour or any other kind of flour for the ground oats and it should come out okay. You may need to add a little water if it’s too thick. 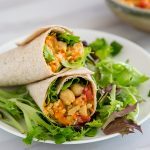 Hi Susan, I just love your recipes they are very good and thank you so much for sharing them! I make them for my 86 yr old Mom, she loves them and they help to keep her weight down. Looking forward to those in the future! When I made this my husband loved it so much I made another one the next day. This time I added unsweetened shredded coconut and we ate that one that day. I made another one the next day as well since my husband has a sweet tooth as we are trying to find healthier sweets for him. Well needless to say by the time we had eaten 3 of these in 4 days, we realized that was plenty of fiber. My husband has a word for when he eats a whole box of shredded wheat and 1/2 gallon of milk, dietaryfibrosis. So a word of caution since it is so good, limit them to 2 a week. How much coconut did you add? It sounds delish! a piña colada cake! I’ve made this a few times now, as cake and as muffins. I have started adding shredded coconut to mine, but otherwise make as is & it turns out really delicious. I really want to make this cake, but is it possible to make it without applesauce? Is there anything I can use to replace it? I am trying to eat vegan and sweets are hardest for me. It’s hard to find edible ones. I love it…. just tasted it and had to tell you. Susan, WHAT TO USE instead of the egg replacement? I don’t buy that product… I’m guessing that I would increase the amt. of sugar-free applesauce in the wet ingred. ?? I’d like to make this on Friday 8/19/11 – please advise & THANK YOU! Marian, if you have cornstarch, use a teaspoon of it instead of the egg replacer and I think it will be fine. Hope you enjoy it! that looks yum! my hubby can’t have pineapeple, but I bet I could sub blueberries or peaches. I am wondering if I make this without the sugar if I need to add dates or stevia?? Or is the pineapple already super sweet? If you leave out the sugar, the balance of wet to dry ingredients will change and your cake might be soggy or gummy. You could try increasing the flour by 1/4 a cup and using stevia, but I make no promises about how it’ll turn out! Some people might find the pineapple sweet enough, but most people wouldn’t. Hi, this recipe looks amazing. I was just wondering if i can use old fashioned rolled oats instead of instant and if i can use regular sugar in the batter instead of demerara. Please advice. I would love to make this asap. Any kind of sugar will work, and I’ve tried it with all oats EXCEPT instant, so old fashioned will be fine. Hope you enjoy it! So i made the cake with the old fashioned oats and regular sugar in the batter but raw for the topping. Doubled the recipe for breakfast to serve 8 people. By the time breakfast was over, 3/4th’s of it was gone. I think it was a HIT. I personally loved the cake. It was moist, filling, not too sweet, and loved the texture. This looks fantastic! I’m going taking this to a party with someone with pineapple allergies though. Could I substitute pureed pumpkin instead, I have left-overs from Thanksgiving? Made this to serve to my sweetie when he gets here later today. I know it will be DELISH!! This looks wonderful and I am going to make it in the next few days. Just wondering whether I would use the same amount of orgran egg replacer as ener-g? Thanks! I’m not familiar with that brand. If it’s powdered, then use however much is equivalent to one egg. Super simple and delicious. I’ll definitely make this again! If I want to fancy it up a bit for a special occasion I’ll top it with some vanilla frosting. Thanks!! 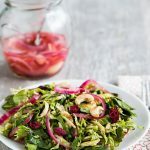 This recipe looks fabulous and I`d love to try it. I have one question though, it`s called coffee cake but coffee isn`t listed as an ingredient. Have I missed something? 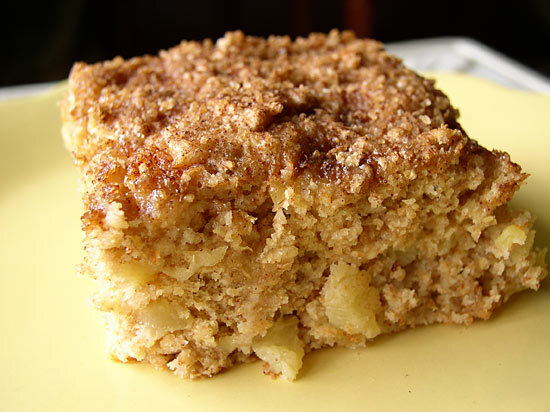 Coffee cake is just the name of a cake that’s traditionally served with coffee. There’s no coffee in it. Hi, I love the sound of this cake and will give it a go. I am wondering about the Energy egg replacer ingredient, as I havent come across this before, dont know where to get it from and what the alternative would be. Can you help please. I live in New Zealand. I can’t wait to make this for my company coming this week! It looks super yummy! This sounds great! However, where is the “coffee” part in the ingredients? May I use fresh pineapple instead of canned? I used stevia, i sub enerG with ground flaxseed and water. I used almond flour and gluten free flour mix , i used fresh pineapple and papaya and pineapple and mango the second time . I made mini loaves and they were all gone in no time ! So much fun to experiment when the result is so yummy! Simply delicious! Subbed pumpkin puree for the applesauce, added 1/2 tsp pumpkin pie spice and crumbled crystallized ginger in with the topping. Haven’t baked with pineapple since the days of yore w/ the iconic upside-down cake! Super tasty (and original) coffee cake – thanks. Can I make this with GF all purpose flour? I made this cake yesterday… it was amazing! I made some slight alterations, including using 2 cups of gluten free flour instead of oat and wheat flour, subbing 1/3 cup agave nectar for the sugar and omitting the applesauce. I also used 1 cup of pineapple that I blitzed in the blender, as I accidentally bought canned pineapple slices instead of crushed pineapple. My family of four demolished half of it already. Awesome recipe! Will make again soon. As I’ve mentioned before, I only eat veganly (is that a word? lol) during certain times of the year (for religious purposes) so I tend to sub dairy for your non-dairy (unless a specific flavor is needed, e.g coconut milk) and also eggs for “n’eggs” (all of your non-egg substitutions……there I go inventing words again) during non-fasting periods. How many eggs is the Ener-G supposed to be replacing? D’oh! Never mind; I saw my answer in an earlier response! Do you think cake flour can be used instead of the whole wheat flour? Cake flour is lighter than whole wheat flour, so you will probably have to use a little more. This cake is tasty, but I found it very dense, and it stuck to my teeth. Thinking of making this cake and cooking it with a pinapple upside down cake topping. do you think this would work? I haven’t tried that so I can’t say for sure, but it’s worth a shot. It worked great. We used to topping from this recipe. It made a very special birthday cake for my Vegan sister and her family. From what I hear, coconut flour is very thirsty–it soaks up liquid much differently than wheat flour–so you would need much more liquid. I haven’t tried it so I can’t really advise how to adapt the recipe. Just made this, and my son, who has never liked pineapple in any form, love it!